I’m one of those people who will start getting sad about the end of a vacation 2 days before the end. I do the same thing with summer. While we still have hot days and temperate summer nights, I’m already lamenting shorter days and the end of summer– which in my case means eating an insane amount of summer fruits like tomatoes. My markets are bursting with so many great varieties. 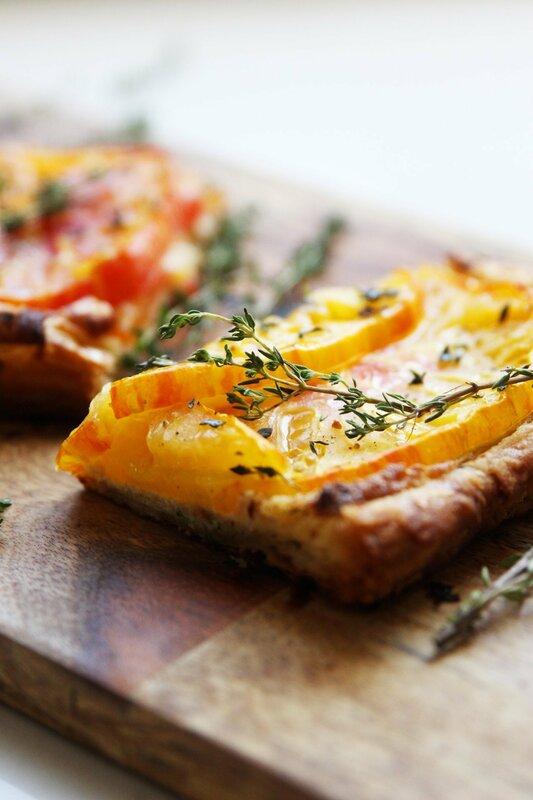 I’ve made savory tomato tarts before but I had been eyeing this Ottolenghi Tomato and Almond Tart recipe for a while now so thought I’d try a new one. What piqued my interest about this one is that it’s a savory version of a frangipane tart (a sweet fruit ground almond tart). This is filled with a savory almond mixture of ground almond, ricotta, parmesan thyme and garlic. 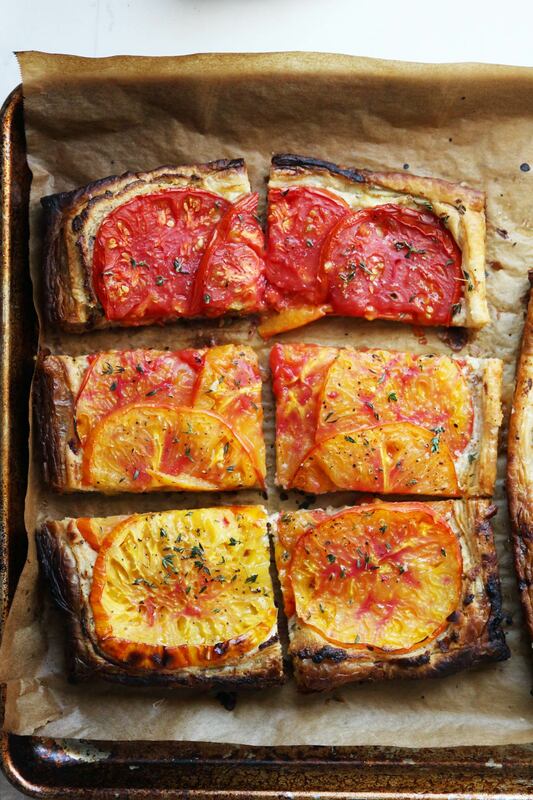 The almond paste mixes with the juicy sweet tomatoes when it’s baked and oh my, it’s perfect. You can use any tomato you’d like, but I’ve used different heirloom tomatoes which happened to look particularly delicious when I made this. Enjoy this last bite of summer! In a stand mixer, beat the butter until light and aerated. With the machine running on medium speed, slowly add the eggs. If the mixture separates, add some bread crumbs to bring it back together and keep on adding the eggs. Stop the machine, add the bread crumbs, almonds and garlic, and work until everything is just combined. Remove bowl from mixer and add ricotta, parmesan, 1 1/2 tablespoon of thyme leaves and 1/4 teaspoon of salt. Fold gently until just combined. 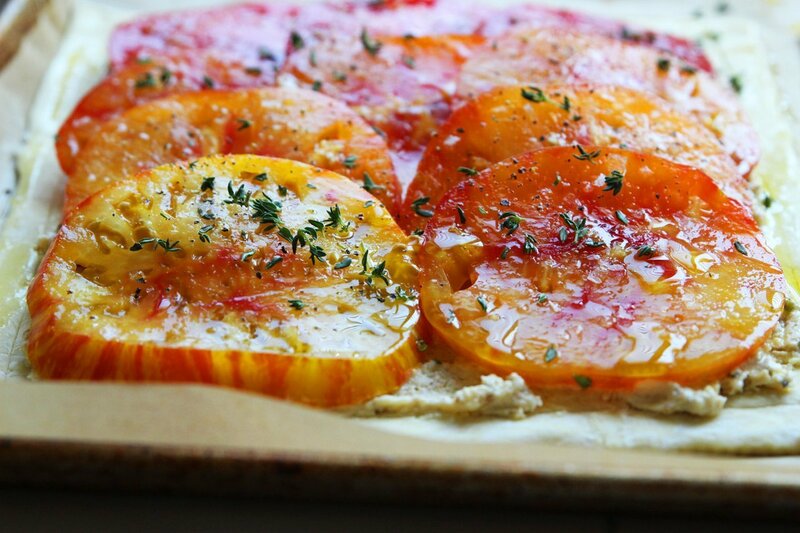 If you’re using heirloom tomatoes, drain the sliced tomatoes and gently pat down with paper towels. 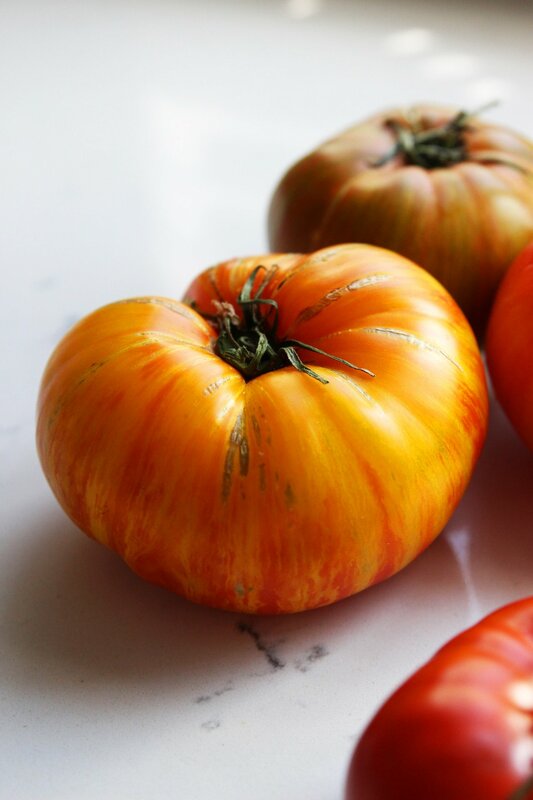 Heirloom tomatoes tend to be juicer than other tomatoes so remove a bit of the excess liquid. Defrost the puff pastry according to the box directions and roll out the puff pastry into two sheets. Line two baking sheets with parchment paper or a Silpat and lay the pastry sheet on top. Score a border about 1/2 inch thick with a sharp paring knife. Spread the almond mixture evenly over the pastries but not over the border. 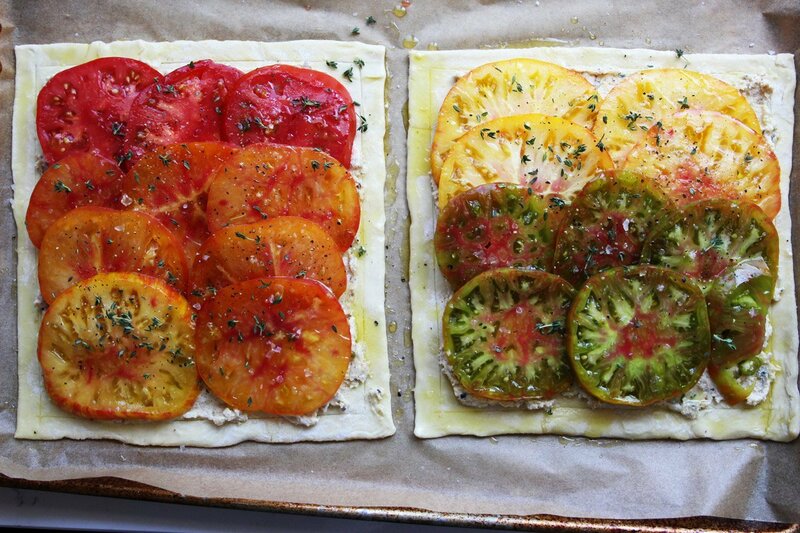 Lay the tomato slices on top of each sheet in rows with a fair amount of overlap in the rows and between them. Sprinkle with the remaining thyme, drizzle with extra virgin olive oil and season with a couple pinches of salt and pepper. Bake for 15 minutes and turn the oven temperature down to 400 degrees and continue baking for another 8-10 minutes until the base is golden brown. Halfway, switch the pans between the racks and rotate them back to front to ensure the tarts color evenly. Remove from the oven and allow to cool slightly. Drizzle with a little more olive oil and cut into squares and serve. Texas in Summer is brutal so im kind of happy that it is starting to cool down. i will miss all the produce for sure. 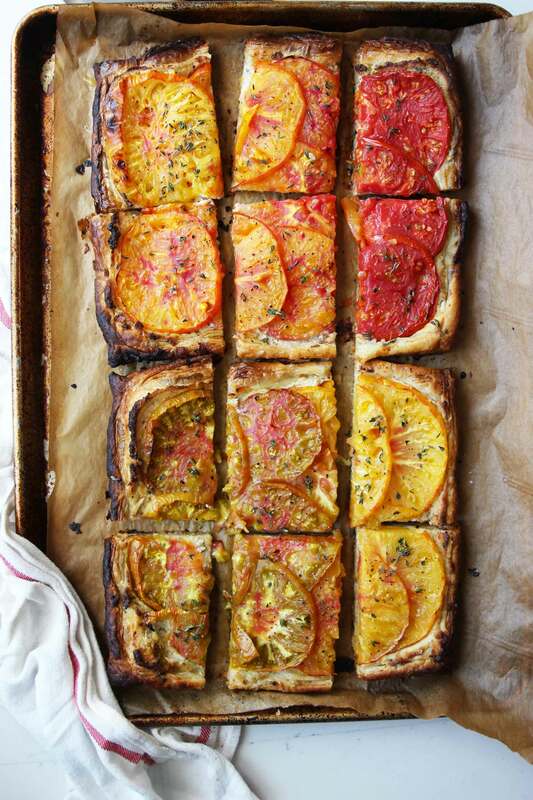 i am digging this tart – esp those juicy tomatoes! This sounds wonderful. Question, what unit of measure for the butter?? 2/3 CUP??? Thanks! Yes cup, sorry about that– I’ve updated the recipe! Looks perfect!! Really love that crust! Ha! Ha! I’m glad I’m not the only one who gets that pit in their stomach when vacation is days from coming to an abrupt end. I travel quite a bit. . .so you think that I would stop such behaviors. . .but nope. Happens every time. 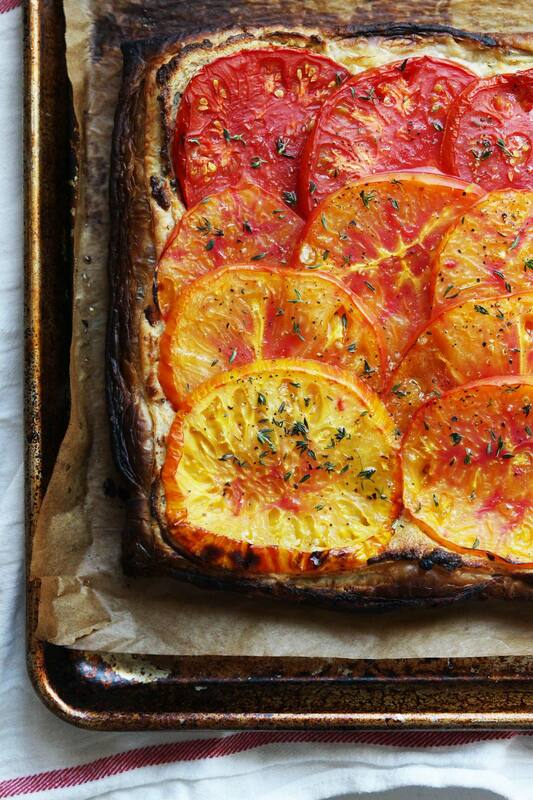 This is such a gorgeous tart. And that filling. . . so, so good. It’s reminding me that I really need to spend a bit more time exploring my Ottolenghi cookbooks. This is a wonderful recipe, right? It is my utter favourite from Plenty More.